Former Congressman Dan Kuykendall, along with Rich Miller and Frank Gomez, was one of the central figures in the private network which worked with Oliver North and Walt Raymond at the NSC, and Otto Reich, Jonathan Miller and Robert Kagan at the Department of State. In the early days of IBC, until the Spitz Channell fundraising efforts flowered, Rich Miller and Frank Gomez were paid a small retainer by Dan Kuykendall. Later, however, the funds began to flow the other way with Kuykendall being the beneficiary of funds emanating from Channell through IBC and I.C., Inc. in the Cayman Islands. He appeared to be the main legislative operator, working with the NSC and, along with Penn Kemble of PRODEMCA and Bruce Cameron, a lobbyist paid by Channell, advising Rich Miller and Spitz Channell on tactics and strategy during the efforts to influence the 1986 votes on Contra aid in the U.S. House of Representatives. [Schedule of Dan Kuykendall Payments; CH 05255; Channell Dep., 9/1/87, at 72-73; Kuykendall Dep., 8/12/87, at 35-37, 42-45, 103-110]. In both 1985 and 1986, Kuykendall presided over regular meetings at his townhouse office on Capitol Hill. These meetings were regularly attended by a group of conservative Reagan supporters including Lynn Bouchey, Sam Dickens, Jim Denton and Peter Flaherty. North, Johnathan Miller, Rich Miller and Frank Gomez also attended on a regular basis and, on at least one occasion, a strategy session was attended by Otto Reich and Walt Raymond. Kuykendall has claimed credit for the strategy of targeting Mike Barnes for the 1986 television ads as a convenient way to reach the whole Congress and hit Mike Barnes at the same time. [Kuykendall Dep., 8/12/87, 35-37, 42-45, supra]. Kuykendall was also Spitz Channell's principal legislative advisor for the 1986 Contra aid effort. In his testimony, Channell said: "In 1986, I nearly lived with Dan Kuykendall because he is such a vast resource on the history of the House of Representatives and the way it works and you just don't take a list of uncommitted Congressmen and say here is an ad, let's go after him." [North's appointment calendar; Channell Dep., 9/1/87, at 72-73; CH 79238]. "… ensure that Max is aboard on the use of former Congressman Dan Kuykendall as the focal point for those who wish to contact and schedule the resistance leaders. Cruz, Calero and Robelo have all agreed to this procedure and Kuykendall is setting up an Ops Center/Secretariat to handle their schedules, calls and staff work under the Gulf and Caribbean Foundation." [March 15, 1985 Memorandum to Robert McFarlane from Oliver North, Walter Raymond and Donald Fortier, Control No. N40603]. In the same memo, Fortier, Raymond and North asked McFarlane to call Pat Buchanan to "help to ensure that those who are operating independently will be responsive to clear cut guidance (Talking Points are attached at Tab A)." Tab A described a coordinated legislative strategy group which was "lean, serious and sharply focused." The group included Walt Raymond, Oliver North, Otto Reich and Jonathan Miller and five or six other White House, NSC and State Department officials. Curiously, in December of 1986, Channell worked out an arrangement with Dan Kuykendall to increase his small retainer substantially just after the Iran/Contra scandal began to break. Over the next seven months, Channell paid Kuykendall approximately $110,000 for his services. The services included a strategy paper, apparently concocted by Kuykendall and Rich Miller, which was designed to guide Channell through the upcoming investigation. Included in the strategy paper was a list of assignments which related to the Congressional investigation of the Iran/Contra affair. [CH 05474; AOO33137; Channell Dep., 9/2/87, at 174-176; 124-128]. "The Select Committees are not even convening until late January and early February. But, during this time, staff members will be picking their targets. We should move quickly to reassure our friends and to placate our new-found antagonists. "We will use copies of checks until the Coopers and Lybrand audit is through, and only with trusted friends. The schedule of meetings and who will attend will be handled by Dan Kuykendall in conjunction with Lyn Nofziger and IBC. The present targets are broken out in three categories: our friends who can publicly support us now; reasonable members who have not supported us but are men of fair play; and our new antagonists who should be forced to see the truth. The list includes all the contact possibilities. During the early stages of 1987, Channell also asked IBC to prepare a white paper on left wing organizations in the United States who were supporting the Sandinistas. The product was such that Miller advised Channell to consult a lawyer before making any use of it. [Miller Dep., 9/16/87, at 670-675]. Kuykendall was also involved in an effort to persuade Channell employee Kris Littledale to meet with a journalist to discredit former Channell employee Jane McLaughlin's public stories about the Channell operation by discussing "certain knowledge that we had regarding Ms. McLaughlin's private life." [Littledale Dep., 9/8/87, at 32-34]. Littledale declined to do so on the advice of his lawyer. Sometime in the spring of 1987, shortly after Littledale had refused the independent counsel's offer of immunity in return for his testimony against Spitz Channell, Dan Conrad and Cliff Smith, he had lunch with Mr. and Mrs. Kuykendall, Spitz Channell and some others at which Spitz Channell said to him, after learning that he had rejected the prosecutor's offer, "I understand we have something to thank you for." [Littledale Dep., 9/8/87, at 32-34 supra]. In his testimony, Littledale told Committee lawyers that after discussions "with my attorney and my family at some length" he "came to the conclusion that we should tell Mr. Walsh's office to sit on a hot rod and rotate and we did so." [Littledale Dep., 9/8/87, at 32]. On February 16, 1987, IBC issued a report to NEPL that reconstructed the disposition of the Contra assistance payments made by NEPL to IBC and I.C., Inc. during the period from July 1985 through the end of 1986. The report contained supporting documentation for many of the relevant transactions. [RM 1-88]. In a summary at the beginning of the report, IBC acknowledged that most of the disbursements of these funds were made "at the request of Lt. Col. Oliver L. North." Moreover, the summary states that "we were assured by [North] at the time that the funds were to be applied solely for humanitarian assistance." [RM 3]. Miller has told the Committees that he would write these statements differently if he were writing them today. [R. Miller Dep., 8/20/87, at 236-237]. On April 29, 1987, Channell pled guilty to a one-count criminal information filed the same day by the Independent Counsel. As noted above, the information charged that Channell, Miller "and others known and unknown to the Independent Counsel" conspired "to defraud the IRS and deprive the Treasury of the United States of revenue to which it was entitled by subverting and corrupting the lawful purposes of NEPL by using NEPL … to solicit contributions to purchase military and other types of non-humanitarian aid for the Contras," in violation of 18 U.S.C. Section 371. The acts identified by the information as part of the conspiracy include the Ramsey, Hunt, Newington, O'Boyle, Garwood and Claggett solicitations. At the hearing in which Channell's guilty plea was accepted by the federal district court, Channell named Miller and North as his co-conspirators. Miller pled guilty to a substantively identical criminal information on May 6, 1987. Both Channell and Miller are awaiting sentencing. The private fundraising endeavors of Spitz Channell and Rich Miller, and even those of minor figures like Roy Godson, all grew out of the desire of the Reagan Administration, particularly CIA Director Bill Casey, to circumvent the strictures of the Boland Amendment and to create a political climate conducive to the resumption of U.S. assistance to the Contras. The success of the private fundraising effort turned on a number of important factors. First, the fuel that powered the engine of the operation was the sizeable contributions of a small though very wealthy group of private U.S. citizens. Of NEPL's $10 million in contributions in 1985 and 1986, over half came from two individuals and ninety percent from twelve. In fashioning his private briefings at the White House and dinners at the Hay Adams, Channell, with North's assistance, was able to create an atmosphere of national danger that appealed to the tax-deductible patriotism of his wealthy and carefully cultivated few. From the funds contributed, the key operatives other than North -- including Miller, Gomez, Channell, Fischer and Artiano -- pocketed hundreds of thousands of dollars. Second, Colonel North's presence pervaded the operation, whether it was in presenting slide shows in the White House to prospective donors, providing weapons lists to Channell, directing funds to and from Cayman Islands and Swiss bank accounts, meeting with donors at the Hay Adams or taking a private plane to Dallas to confer with a large contributor. Third, although President Reagan's role in the private funding operation is not entirely clear, it is apparent that the use of the White House and the President's name in the fundraising schemes of Channell and Miller provided a sizeable amount of sustenance and a sense of legitimacy to the whole operation. Fourth, the operation exhibited a healthy contempt for the spirit of Congressional limitations. In effect, the Boland Amendment was merely a technicality to be avoided by a carefully choreographed lethal aid solicitation pas de deux. Fifth, the State Department was used to run a prohibited, domestic, covert propaganda operation. Established despite resistance from the Secretary of State, and reporting directly to the NSC, the Office of Public Diplomacy for Latin America and the Caribbean attempted to mask many of its activities from the Congress and the American people. Finally, one of the CIA's most senior covert action operators, was sent to the NSC in 1983 by CIA Director Casey where he participated in the creation of an inter-agency public diplomacy mechanism that included the use of seasoned intelligence specialists. The operation spawned Rich Miller and Frank Gomez, who were sustained with sole-source, no-bid State Department contracts and co-opted Spitz Channell and his cohorts in the private sector. This public/private network set out to accomplish what a covert CIA operation in a foreign country might attempt -- to sway the media, the Congress, and American public opinion in the direction of the Reagan Administration's policies. 1. The CRS study on "Public Diplomacy, Project Democracy and Contra Aid" (attached to this Chapter as an Appendix), describes, from completely public source documents, how the Reagan Administration structured a public diplomacy operation to include domestic as well as overseas efforts to build support and raise private funds for Administration policies, especially those dealing with Central America. 2. In July 1986, IBC itself entered into a joint venture with David C. Fischer and Associates, a consulting firm founded by a former aide to President Reagan. [r. Miller Dep., 8/20/87, at 93-95]. 3. In Audit Report No. 7PP-008, July 1987, the State Department's Office of Inspector General filed its conclusions reached after a special inquiry into the awarding and supervision of these contracts with Gomez and IBC. That report concluded, in summary, that, while the original contract was justifiable, its utility became questionable during its later stages. The Inspector General also criticized the process for awarding and administering the contracts, especially the classification of one version of the contracts as "SECRET," indicating that the classification was unjustified and improper. [Audit Report at 32-33]. 4. In September 1984, IBC would also begin to represent separately one of Calero's own organizations, the Nicaraguan Development Council (NDC). Initially, IBC charged NDC $3,000 per month for public relations services, a fee that was later raised to $5,000 per month when IBC hired a full-time employee to do work for NDC. This financial relationship with NDC began at about the same time that Miller and Gomez were introduced to Oliver North by officials of the Office of Latin American Public Diplomacy. [R. Miller Dep. 8/20/87, at 285-286]. 5. 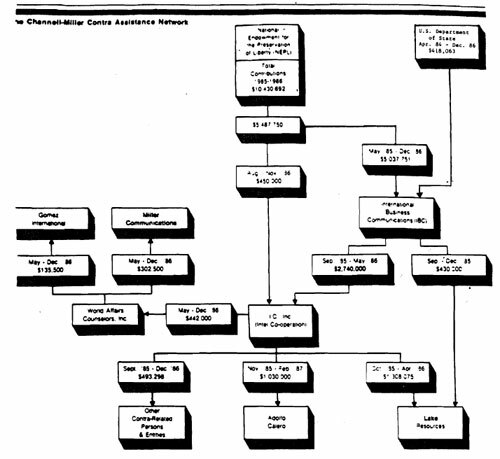 Channell formed additional entities between 1983 and 1986. The American Conservative Trust State Election Fund (ACT-SEF) was formed as a state PAC to take advantage of state laws allowing corporate contributions to such entities. "Sentinel" was formed in 1983 as a lobbying organization under Section 501(c) (4) of the tax code. Channell also formed another federal PAC called the Anti-terrorism America Committee (ATAC). All of these organizations were involved in Channell's efforts to influence the Congress on Contra aid. "Grow Washington" and "Grow Potomac" were corporations established to pursue specific initiatives that, according to Channell, never materialized. Those entities have therefore remained inactive and unfunded. In 1986, Channell assumed control of another conservative organization, Western Goals, which had been established by the late Congressman Larry McDonald. [Channell Dep., 9/1/87, at 62-66]. 6. With respect to this conversation, Roberts told the Committees in an interview that he possibly described Miller as "fronting for the State Department" or as "in the family." [7/17/87 Memorandum of John Roberts interview]. 7. When Ramsey was shown a copy of the transcript, he indicated that, while portions of the dialogue seemed familiar, "[t]here is very much on there I have never heard of before.' [Ramsey Dep. at 70]. Ramsey suggested that Channell, Conrad, Miller and Gomez "might not have ask[ed] for the money [for lethal supplies] directly." Instead, "[t]hey were just saying that if the [Contras] had the money they could buy them." [Ramsey Dep. at 87]. 8. North presented a version of his slide presentation during the public hearings. [7/14/87, at 41-52]. 9. Some donors who contributed money to Calero through NEPL had received expressions of appreciation from North prior to the June 27 briefing. [e.g. RM 3577]. These communications were apparently arranged by Miller at Channell's request. [R. Miller Dep., 6/23/87, at 27]. 10. For a more detailed account of the Prince's activities in connection with operations and persons under investigation by the Committees, see Chapters ___ and ___. 11. According to Miller, he spent approximately $370,000 on activities involving the Prince. North was aware of and approved these expenditures. Miller did not incur monetary loss, however, because North authorized Miller to reimburse himself for these expenditures from Contra assistance funds transferred to IBC from NEPL. [R. Miller Dep., 8/21/87, at 404-407]. The Prince eventually was determined to be a fraud, and now is imprisoned for a separate swindle involving a Philadelphia bank. 12. This was the first time North used an airplane supplied by NEPL; on one other occasion, NEPL chartered a plane to fly North and his family for a weekend visit to a NEPL contributor's house in Connecticut. [Channell Dep., 9/1/87, at 148]. (See Part ___, below). 13. Miller later heard from Calero that no missiles had been received by the Contras. North told Miller that the Newington money had been used to purchase "secure radios." [R. Miller Dep., 8/20/87, at 237]. 14. The Committees' accountants have concluded from Enterprise records that O'Boyle's contribution was used for general Contra support, not for the purchase of two Maule aircraft. 15. At the meeting in New York, O'Boyle expressed to Channell some concerns about the legality of using tax deductible contributions for weapons. According to O'Boyle, Channell told him that a lawyer had advised favorably on the question of legality, but that in any event the money could not be traced because contributions were being passed through a for-profit corporation and overseas. [O'Boyle Dep. at 91]. 16. McFarlane testified in his second appearance before the Committees that he did not recall any such meeting. [McFarlane Dep., 7/14/87, at 129]. 17. During the relevant time periods IBC received $356,472 under its contract with the State Department, $39,000 from Calero for services, $180,000 from affiliated entities, and $407,304 from other individuals or organizations. In other words, the amount retained by IBC from NEPL accounted for nearly 60 percent of IBC's income in 1985 and 1986. 18. The Attorney General denied that he offered such advice to North. [Meese Dep. at 103]. See Chapter ___ for a more complete description of the events in November 1986. 19. According to Miller, he told North in late 1986 that he "hoped to hell the account had been used for humanitarian assistance." North responded "Oh Hell, yes." [R. Miller Dep., 8/21/87, at 331]. The Reagan Administration has always emphasized the policy role of what it calls "public diplomacy." Previous Administrations since the mid-1960s had adopted the term as a more palatable alternative to "propaganda" to characterize the overseas information and cultural exchange programs of the United States Information Agency (USIA). Such programs can be traced back to the Truman Administration, when the remnants of wartime propaganda operations were folded into the Department of State. The actual term, "public diplomacy," was coined by Dean Edmund Gullion of the Fletcher School of Law and Diplomacy at Tufts University in connection with the founding of Fletcher's Edward R. Murrow Center of Public Diplomacy in 1965. Since USIA's role overseas was that of a Government agency communicating openly or publicly with foreign peoples, it was contrasted with more traditional government-to-government "private" diplomacy. However, the term took on a new and broader connotation under the Reagan Administration. It was seen as including domestic as well as overseas efforts to build support for Administration policies, especially those dealing with the Central American initiative. It might be noted at this point that there may be some connection between the Administration's redefinition of the term "public diplomacy" -- especially its use in "educating" the American public -- and the longstanding statutory prohibition on the domestic dissemination by the U.S. Information Agency (USIA) of its materials to the American people. Under the terms of section 501 of the Smith-Mundt Act (the United States Information and Educational Exchange act of 1948, as amended -- P.L. 80-402), USIA and its predecessor agencies have been enjoined from propagandizing the American people. The London speech was the first step in a U.S. Government effort to publicize and implement the President's "democracy initiative," as it came to be called. A cabinet-level meeting took place August 3, 1982, to discuss a Government organizational structure for a public diplomacy program to achieve these goals. Although the meeting reportedly considered Central Intelligence Agency (CIA) involvement and unspecified covert activities, the New York Times reported on February 3, 1983,  that then Deputy National Security Adviser Robert C. McFarlane subsequently announced that such plans would not be implemented because of the predictably negative impact they might have on the success of the total program. Four years later, however, on February 15, 1987, the New York Times published a different version of the 1983 McFarlane interview, stating that the Administration had decided at the August 3, 1982, cabinet-level meeting that the democracy initiative (part of which would later be called "Project Democracy") would indeed have a covert side operated from the National Security Council. The participants in the meeting allegedly discussed CIA involvement and some means of "liberalizing" law and executive order to permit covert action on a broader scale by the CIA and the NSC-level National Security Planning Group (NSPG). However, McFarlane allegedly commented that Project Democracy's covert side would be run from the NSC because CIA involvement would "destroy" the entire program. d. The International Broadcasting Committee, to plan and coordinate U.S. international broadcasting activities. NSDD-77 also noted that "public diplomacy activities involving the President or the White House will continue to be coordinated with the Office of the White House Chief of Staff." It observed that the NSC staff, in consultation with the regular members of the SPG, would provide staff support to the SPG and facilitate effective planning, coordination, and implementation of plans and programs of the four committee chairmen or their designees to insure inter-committee coordination. Among the concrete results of the issuing of NSDD-77 were the establishment outside Government of the National Endowment for Democracy and the creation within the Department of State of two new offices charged with "public diplomacy" responsibilities. The executive branch originally responded to the President's democracy initiative by proposing a new $65 million USIA program for Fiscal Year 1984 to be called "Project Democracy." Congress disagreed with this plan and authorized instead the establishment of a bipartisan, private (although largely Government-funded), non-profit corporation called the National Endowment for Democracy (NED). The NED was intended to help build the "infrastructure of democracy" in countries with weak or poorly functioning democratic political systems. The President subsequently supported this move. Although opinion in Congress was divided on the usefulness of such an entity, it had powerful backers in both parties and both chambers and was successfully, if somewhat tentatively launched in 1983. It has survived repeated efforts by critics in both Houses, both parties, and from both liberals and conservatives, to halt continued Federal funding of its operations. The NED organized four "institutes" defining its major areas of operations -- the AFL-CIO Free Trade Union Institute (FTUI), the National Democratic Institute for International Affairs (NDIIA), the National Republican Institute for International Affairs (NRIIA), and the Center for International Private Enterprise (CIPE). The Endowment makes grants to the institutes, which are known as the "core grantees." They, in turn, make grants to individual recipients. In addition, NED also makes some grants to other groups engaged in the broad panoply of activities subsumed under building democracy abroad. The trade union institute receives the largest share of NED funds, but the party institutes have been the most controversial. Some critics feared that the parties would use the institutes' budgets as "slush funds" and numerous safeguards have been written into law during the years since 1983 to prevent this. NED budgets have ranged from $18 million in FY 1984 to $15 million in FY 1987. It was set up in mid-1983 with a staff of two. By fiscal year 1986, the staff had grown to 19--9 State Department personnel and 10 non-reimbursable detailees from other U.S. Government agencies, such as the Department of Defense and USIA -- and had an annual budget of over $1 million. Its professional staff produced numerous press releases and other publications and traveled widely making speeches in support of the Administration's Central America policy. In addition, S/LPD brought Central American defectors to the United States to participate in media events. If this was an accurate observation, what had USIA been doing since 1951? The Office for Latin American Public Diplomacy became controversial in early 1987 when it was revealed in the press that in 1986 it had awarded a secret contract for $276,186 to International Business Communications, Inc., a public relations firm that had worked with Oliver North to rally public support for the Nicaraguan contras. The contract came under review because it was signed September 2, 1986, eleven months after its effective date of October 1, 1985, and because it was classified SECRET. The audit by the State Department Inspector General revealed that S/LPD had let some seven contracts and purchase orders totalling $441,084 between February 14, 1984, and September 30, 1986, with IBC, Frank Gomez (one of IBC's principals), or the Institute for North-South Issues (INSI), another Gomez company. In addition, funds belonging to IBC were at various times transferred directly or through another Miller/Gomez corporation called Intel-Cooperation to Richard Secord's Swiss bank account in the name of Lake Resources, Inc. INSI also received grants totalling nearly $500,000 from the National Endowment for Democracy, but NED cancelled the grants when INSI's possible connections to the Iran/contra affair were publicized. Both IBC and INSI were controlled by Gomez and Richard R. Miller; the two men were linked with Carl R. "Spitz" Channell in his efforts to solicit funds to support the contras. Channell named Miller as an alleged co-conspirator when he (Channell) pleaded guilty on April 29, 1987, to conspiring to defraud the U.S. Government in raising funds for his tax-exempt charitable foundation, the National Endowment for the Preservation of Liberty -- not to be confused with NED. Miller worked together with Channell in a group of nine companies that were involved in the covert effort to supply arms to the contras. Oliver North referred to the nine as the "Project Democracy companies." No organic connection has yet been made between North's "Project Democracy" and the Administration's FY 1984 USIA Project Democracy proposal, nor, for that matter between North's efforts and the National Endowment for Democracy. Both the White House and NED President Carl Gershman have strongly disavowed any NED links with North's Iran/contra operations. The only tie thus far uncovered between North and NED was its grant -- later cancelled -- to the Institute for North-South Issues described above. In addition, the Tower Board, in its Report of February 26, 1987, stated that it had "no information linking the activities described herein as 'Project Democracy' with the National Endowment for Democracy." Nevertheless, it is possible to trace the origins of all these operations to a common policy initiative -- the original public diplomacy/democracy structure and program discussed at the August 1982 Cabinet meeting and laid out in NSDD-77. During his testimony before the combined House and Senate Iran/contra investigating committees on July 13, 1987, under questioning by Representative Dante Fascell, Oliver North admitted that he had "inquired into" expediting signing of and payment for the IBC contracts with S/LPD. It also appears that S/LPD threw its bureaucratic weight around -- the Inspector General's Audit Report used the term "steamrolled"  -- the Department in order to pursue its dealings with IBC and Frank Gomez, disregarding appropriate regulations. The Inspector General's Audit Report found a number of questionable actions taken with regard to the letting of contracts and purchase orders by S/LPD to IBC and S/LPD's acceptance of IBC's performance under these contracts. The report also noted that some of the information on the contract provided by the Department to Congress and its own Public Affairs Bureau press briefer was "inaccurate, incomplete, and misleading." Nevertheless, it would appear that in general, the audit report was drafted in a somewhat diplomatic manner, perhaps so as to minimize the apparently unorthodox and often highhanded behavior of the Office of Latin American Public Diplomacy in fulfilling its objectives. The office appears to have assumed a relatively lower profile since the departure of Reich. The Inspector General also found no evidence that IBC had performed lobbying activities for the Department under contract, although it stated that its work did not include activities performed by IBC or Frank Gomez for other clients. Evidence was found, however, indicating that S/LPD participated in a group with other organizations and private citizens that performed functions from which it was prohibited. In other words, it took part in an orchestrated campaign in which public relations functions were distributed on the basis of who could and who could not, under law, perform them. Otto Reich denied that his office had engaged in lobbying and informed the Inspector General that he had been alert from the beginning "that his official public diplomacy functions would put him close to the prohibitions against lobbying contained in the State Department appropriations acts and the anti-lobbying statute." He also requested guidance from the State Department Legal Adviser's office and circulated instructions to his staff in that regard. S/LPD principals apparently shared some of the views and priorities expressed by John Poindexter and Oliver North during their testimony before the joint Iran/contra committee hearings: the end justified the means and attention to legal and bureaucratic requirements was less important than getting the job done. In addition, they appeared to have been motivated to pursue what they came to call "public diplomacy" efforts because the Administration's Central American policy was not capturing the imagination and support of the American people. They believed that this was so simply because the public was not sufficiently familiar with that policy to understand its basic rectitude. Convinced that their interpretation of "public diplomacy" was the solution to this problem, they could not accept the possibility that the policy was unpopular because the public might consider it misguided. 1. Letter to Joel Woldman from Katherine Wyman, Secretary to Dean Gullion, dated Sept. 13, 1974. 2. National Security Decision Directive 77 on Management of Public Diplomacy Relative to National Security, as quoted in U.S. Congress. House. Committee on Foreign Affairs and Subcommittee on International Operations. Hearings [Mar. 3, 1983] and Markup on H.R. 2915, Foreign Relations Authorization for Fiscal Years 1984-85. 98th Cong. 1st Sess. Washington, U.S. Govt. Print. Off., 1984: 131-132. 3. Lord, Carnes. In Defense of Public Diplomacy. Commentary. April 1984: 42. 4. U.S. President (Reagan). Speech before British Parliament, June 8, 1982. 5. Gerth, Jeff. Problems in Promoting Democracy. New York Times, Feb. 4, 1983. 6. Brinkley, Joel. Iran Sales Linked to Wide Program of Covert Policies. New York Times, Feb. 15, 1987: 20. 7. As quoted in U.S. Congress. House. Committee on Foreign Affairs and Subcommittee on International Operations. Hearings [Mar. 3, 1983] and Markup on H.R. 2915, Foreign Relations Authorization for Fiscal Years 1984-85. 98th Cong. 1st Sess. Washington, U.S. Govt. Print. Off., 1984. p. 131-132. 11. Brinkley, Joel. Iran Sales Linked to Wide Program of Covert Policies. New York Times, Feb. 15, 1987: 20. 12. For a more detailed discussion of the development of the NED, including its legislative history, see Joel M. Woldman, The National Endowment for Democracy, CRS Issue Brief 83107, (archived 1/20/87, updated 4/2/87). 13. Audit Report on the Use of Funds Granted by the National Endowment for Democracy to Friends of the Democratic Center in Central America [PRODEMCA], as quoted in U.S. Congress. Committee on Foreign Affairs. Subcommittee on International Operations. Oversight of the National Endowment for Democracy. Hearings. May 14 and 20, June 11, 1986. Washington, U.S. Govt. Print. Off., 1986. p. 279. 15. NED also has been criticized in the past because its funds found their way in 1984-1985 to right-wing French groups dedicated to the overthrow of the Mitterand government and for alleged interference in elections in Panama in 1984. In both cases, the grants were made by NED's trade union institute (FTUI). 16. U.S. Department of State. Office of the Special Advisor to the Secretary of State for Public Diplomacy (S/PD) [multilithed handout], c. early 1984. 17. Hereafter this office will be referred to as the Latin American Public Diplomacy Office. 18. The other public diplomacy office was disbanded when its director resigned and returned to private business. 19. U.S. Department of State. Office of Inspector General. Audit Report No. 7PP-008. Special Inquiry into the Department's Contracts with International Business Communications and its Principals. July 1987. p. 7. Hereinafter referred to as Audit Report 7PP-008. 20. U.S. Congress. House. Committee on Foreign Affairs. Subcommittee on International Operations. Oversight of Public Diplomacy. Hearing. July 16, 23; Aug. 6, and Sept. 24, 1986. 99th Cong., 2nd sess. Washington, U.S. Govt. Print. Off., 1987. p. 106. 21. Audit Report 7PP-008. p. 13. 22. Ibid. Exhibit C. Memorandum from Coordinator of ABA/LPD dated June 25, 1987. p. 2. 24. Didion, Joan. Washington in Miami. N.Y. Review of Books. July 16, 1987: 25. 25. Omang, Joanne. The People Who Sell Foreign Policies. Washington Post. Oct. 15, 1985: A21. 26. Didion, Washington in Miami: 25. 27. Audit Rept. 7PP-008. p. 15. 28. Audit Rept. 7PP-008. p. 14-15. 29. U.S. House. Committee on Foreign Affairs. Subcommittee on International Operations. Hearings on Oversight of Public Diplomacy. July 23, 1986. p. 115. 30. It is not implausible, however, that someone on the NSC staff familiar with the NED might have had some input into the choice of this name. 31. Endowment denies ties to Col. North. Washington times. Feb. 17, 1987: 2A. 32. U.S. President's Special Review ["Tower Commission"] Board. Report. Feb. 26, 1987. p. III-22 and C-11. 33. Audit Report 7PPP-008. p. 30. 36. According to Joanne Omang of the Washington Post, the Latin American Public Diplomacy Office was transferred to the ARA Bureau because Assistant Secretary Elliot Abrams wished to bring it more under his own control. Possible Illegal Lobbying Probed by State Dept. Washington Post. Feb. 14, 1987; A32. 37. Ibid., Exhibit C, Memorandum from Coordinator of ARA/LPD dated June 25, 1987. p. 4. 39. U.S. Congress. Joint Hearings on the Iran-Contra Investigation. Continued Testimony of Oliver L. North. [unedited transcript] July 13, 1987. p. 77. 40. Audit Report 7PP-008. p. 19. 44. Audit Report 7PP-008. p. 22. 45. Ibid. Exhibit B. Memorandum from Former Coordinator of S/LPD dated July 17, 1987. p. 12.